Elmer Charles Bigelow had the courage of his convictions. 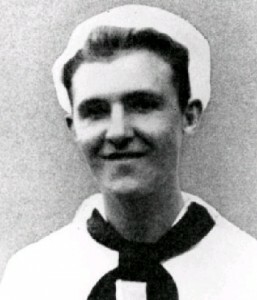 The 25-year-old from Hebron, Illinois, enlisted in the US Navy at the beginning of WWII, and after training was assigned to the USS Fletcher, a destroyer that was part of the US Pacific fleet. During fighting in the Philippines, the Fletcher was hit by a shell that exploded in one of its powder magazines, starting a fire and the possibility of an explosion that could have destroyed the ship. Bigelow’s actions give us insights into his convictions. He freely enlisted in the Navy, demonstrating his patriotic support for the American fight against Japanese tyranny. In doing so, he set aside his personal ambitions and became a small part of a greater whole, a lowly sailor on a great fighting ship, following orders and doing his part as a member of a team to support the war plans of his superiors. And as a member of that team, Elmer Bigelow took on himself a personal responsibility for its wellbeing. When his fellow sailors were threatened, he sacrificed himself in an individual act of valor that probably saved the lives of hundreds of his shipmates. Bigelow’s actions speak volumes about his character, and about the values and principles that guided his life and led him to a moment of selfless, courageous action when that need presented itself. “And for the support of this Declaration, with a firm Reliance on divine Providence, we mutually pledge to each other our Lives, our Fortunes, and our sacred Honor.” — closing line of the Declaration of Independence as it was unanimously adopted on July 4, 1776. From the founding of America to this present July 4, American men and women continue to demonstrate the courage of their conviction that this country is a place and an ideal worth defending and protecting. Americans like Elmer Bigelow have had the courage to sacrifice themselves in the hope that the American experiment might be strengthened and preserved with their blood. And it has been. On this July 4, in between the picnics and softball games and fireworks, may we each renew our dedication to make America a land of liberty and justice for all, and may we have the courage of our convictions to commit our own Lives, Fortunes and sacred Honor to preserving America for future generations.